The Planning Phase – For the perfect fit of your teeth. Prior to the treatment, we check if your lower jaw provides enough substance for the prosthesis. 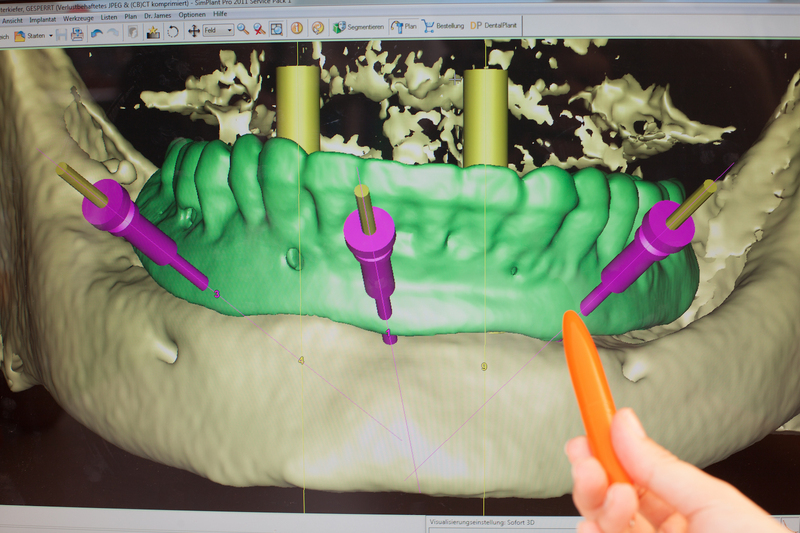 If it is not sufficient, it will be reconstructed simultaneously to the implant procedure. We check the quality of your prosthesis as well. It should not be too worn out or contain metal parts. We prepare a new one for you in case your old prosthesis is unsuitable. The prosthesis is temporarily converted to an x-ray template for the 3-D radiograph (DVT). The subsequent position of the implants is then determined inside the digital volume tomography (DVT). After this, the planning phase is rapidly concluded and an SOS SurgiGuide template can be ordered. After 5-7 days, the final SOS template is delivered via courier. The operation, taking only a few minutes, can now commence. We are looking forward to explain to you, how you can get back your relaxed smile again soon.